So far we haven’t seen many kings or coho in our harbors in Southeast Wisconsin. However, as temperatures cool and we get some rain I’m expecting a fresh batch of salmon to migrate into our harbors and river systems. I’ve been fortunate to catch a few salmon already and recently cured a batch of skein to prepare for our traditional October salmon run. I always run a slip bobber and cured skein for salmon. I do a lot of drifting in the harbor with it, especially in places I can find current. 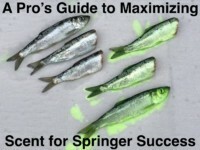 Some salmon eat the skein and others just crush up the eggs so you need the bobber as an indicator or you might not be able to detect the bites. 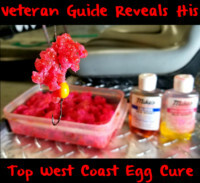 Many anglers use different colors of egg cure in Wisconsin. I start the season with natural skein. Later in the fall I switch to orange and pink. I use the BorX O Fire exclusively because it’s so easy to cure the skein with it. It creates vivid colors and eggs the milk for a long time. I cure my skein for 24 hours. However, if you need skein sooner the cure works right away. Another thing I like is BorX O Fire won’t burn your eggs. You can dump a whole bottle on the skein and it won’t hurt it at all. After catching a salmon I always bleed it out. It’s important not to leave any blood on your eggs. I pat them dry with paper towel to make sure no remaining blood is on them. If you don’t start with a good egg you can’t end up with a good egg. Cut the skein in individual pieces. The pieces should be the size you want to use when fishing. It’s easier to cure your eggs when cutting them into smaller pieces. I then sprinkle BorX O Fire on the skein. I work the skein around with my hands to make sure the entire skein gets covered in the cure. Place the skein in gallon bags. Shake the bag from time to time to get all the juice throughout the eggs. Then set the bag in the fridge for 24 hours. They are now ready to fish. Honestly people don’t believe how easy this process is. They think it’s difficult to cure eggs. I’ve tried many other cures and this is the easiest cure I can find. Plain and simple, it’s what I caught all my salmon on for the last few years. A common question I get is what size to cut the skein into. That’s a tough one to answer. There’s a time where I’m using a small piece the size of a quarter up to a 50-cent piece. And, other times I’m using a golf ball size piece. Meanwhile, when fishing for Wisconsin salmon I use 15-pound Power Pro as my main line and 12-pound Vanish fluorocarbon as leader line. Editor’s Note: Kyle Deavers runs Big Boy Fishing. For info on his Southern Wisconsin walk in float fishing with skein trips please visit Big Boy Fishing on Facebook.